We have a new favorite sandwich wrap. 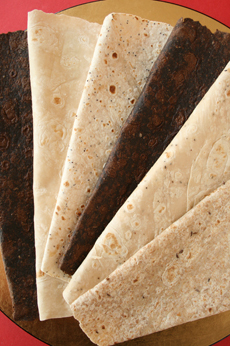 Tumaro’s, the first company to introduce flavored tortillas, has added New York Deli Style Wraps to its line of gourmet tortillas and wraps. The five flavors are inspired by New York deli breads: Rye, Pumpernickel, Sour Dough, Everything and Cracked Pepper. The wraps are rolling out now to both mainstream and specialty markets nationwide. A four-pack retails for $2.99 to $3.99. Tumaro’s New York Deli Style Wraps range from 80-100 calories per wrap. A sandwich uses two slices of bread, adding up to 140-240 calories. Bagels, depending on the size, can range from about 215 calories for a small bagel to almost three times that. We appreciate that that the wraps are thin and flexible—easy to fold. All the flavors are delicious, but Pumpernickel and Rye provide authentic “deli sandwich” flavor. Cracked Pepper offers a nice burst of pepper that works especially well for a scrambled egg wrap. Find more of our favorite breads, plus recipes, in our Gourmet Breads Section. See all the different types of bread in our Bread Glossary.